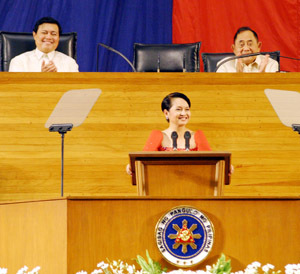 UPDATE: CLICK HERE TO READ THE FULL TRANSCRIPT OF PGMA’S SONA 2009! Many, of course, are waiting with both anticipation and greater anxiousness for President Gloria Macapagal Arroyo’s State of the Nation Address (SONA) tomorrow, July 27. This is (hoped to be) the last SONA of La Gloria, whose term is ending in 2010 — unless a) the administration finally succeeds at amending the charter; or b) she wins as representative of Pampanga’s second district, and becomes Prime Minister once the charter is amended. More than the accomplishments, promises, visuals, and gimmicks that accompany each Arroyo SONA, what is anticipated of this upcoming SONA is the of direction the country will be headed for in 2010. This will largely be dependent on whether or not PGMA declares that she will indeed step down. If we look at PGMA’s SONA in 2007, she did indicate her intention to step down by saying that she will not obstruct the ambitions of those who wish to take her place in 2010. On June 30, 1992 the traditional ceremony of political succession will unfold at the Luneta. The last time it was done that way was in 1965. I shall be there with you to proudly witness the event. This is the glory of democracy, that its most solemn moment should be the peaceful transfer of power. Maraming Salamat sa inyong lahat at paalam. President Fidel Ramos, despite his own moves to amend the charter, made clear about his stepping down when he delivered his last SONA in 1997. The problem is, even if PGMA does make a declaration to step down, who would believe her? Can one blame Pinoys for not trusting a president who, in 2002, said she was not running for reelection? Do consider that PGMA’s recent actions do not point to her wanting or planning to step down next year. Aside from her frequent trips to her home district and the efforts of allies to still pursue charter change, consider the alleged moves of Arroyo to form a revolutionary government. Stretching it further, one may as well add to the list of considerations, PGMA’s upcoming trip to Washington where she will meet with President Barack Obama. There is speculation that the transfer of the Guantanamo detention camp to the Philippines is on the agenda. There is pressure on Obama to fulfill his campaign promise to close it down within a year. It may be possible then that Washington would back the extension of Arroyo, provided that she is able to do it legally. It has been said that Arroyo had approached Washington in the past to get support for a declaration of emergency rule in 2005, when the political situation here had been very unstable. What can Arroyo lose by asking again, especially when the US needs something from the country? It is now up to Arroyo to clear things up. But as always, it is up to a vigilant citizenry to make sure that the path to 2010 and beyond will be good for the national interest. This entry was posted in Commentary by Ralph. Bookmark the permalink. It’s a fact that PGMA had lots of mistakes in the past.. but she’s just a person like us.. though much is expected from her as a president.. I believe that as a president she has conributed much to the country.. Pls. don’t blame her for every bad thing that is happening in our country. Lets be reminded that we also need to do our part as a citizen of this nation..
PGMA will be remembered as the president in whose term our foreign debt doubled. In short, UTANG.